What’s the Best Commercial Weed Eater? — and by “commercial” I simply mean ‘heavy-duty.’ The difference between a commercial weed eater and a consumer-grade weed eater is that the overall build quality is higher as it needs to withstand endless hours of usage and accidental bumps and knocks. Also, although there are several types of weed eaters (gas, battery & electric); in this article we stick to reviewing gas models. Why? Well, because battery power is limited and managing an electrical cord is impractical when you work for extended periods of time. If you’re a professional and you expect to work hours upon hours, day after day, then a gas weed eater is the obvious choice. Before we get into the heart of this article let’s go over the variety of ways you can refer to a weed eater. It seems that everyone has their own name for it. When I was a kid, growing up in the 70’s, our family called it a ‘weed eater.’ The following names are also common: string trimmer, weed wacker, line trimmer, whipper-snipper, line-trimmer and even strimmer (UK/Ireland). We review several excellent industrial-grade weed eaters that are suitable for landscapers or homeowners. Many homeowners invest a little extra money and purchase a weed eater that will last. 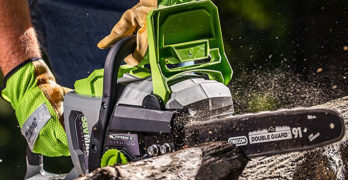 Unfortunately, there’s no shortage of cheap string trimmers, but you can be certain that they won’t last very long if you intend to use it on a regular basis. I have a very large garden with acres of lawn to maintain. This makes my weed eater one of the most important garden tools in the shed. They go by many names: string cutter, brush cutter, bush whacker, or edge trimmer, to name a few. Though weed eater is the best name of the lot, it really describes these versatile garden tools to a tee. They do, literally, eat through weeds like no other. Weed eaters come in many variations. You get small electric corded models that are really only suitable for small lawns. Larger electric machines (battery or corded) are okay for most residential gardens but for commercial landscapers and those of us who have bigger than average yards, a commercial weed eater is the best tool for the job. So, what are the criteria for the best commercial weed eater? The main difference is how it derives the power. 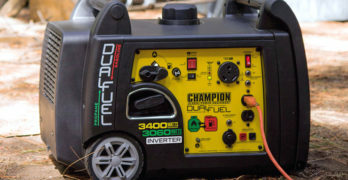 While electric is convenient, quieter, and you don’t have gas fumes, they simply don’t have the power to meet the needs of landscapers and people with large gardens. So if we’re going to be talking about the best commercial weed eaters, we need to look at gas-powered machines. Weed Eaters use small lightweight gas engines. The weight is important because you’re carrying the entire weight of the engine and all the other components that make up the weed eater. You need to be able to maneuver the weed eater freely and a heavy machine is not going to be practical. The type of engine is also important. This can either be a 2-stroke (2-cycle) or 4-stroke (4-cycle) engine. For the high-rev power that a weed eater needs, 2-stroke engines are the best. But this extra power does come with its disadvantages. You need to pre-mix your oil and gas and this needs to be done at the correct ratio. If there’s not enough oil in the mixture, the engine will overheat and this damages the engine. Too much oil, and the engine will smoke excessively. Carbon will build up on the spark plug, hindering the engine’s performance. These engines are also noisier and not as environmentally friendly, they have higher emission levels of harmful toxins. A weed-eater with a 4-stroke engine might not have the same power, but they are much less hassle. The oil is added to the crankcase. This means that you have to keep an eye on the oil level, but most modern 4-stroke engines have an automatic shutoff switch that will stop the engine when the oil level drops too low. You also don’t need to measure your oil and fuel, you simply add oil to the engine through a filler cap when needed. Four stroke engines are quieter and emit less toxic fumes. Generally, you won’t have as many maintenance issues with a 4-stroke engine, mostly because the plug and carburetor don’t collect as much carbon or oil residue. 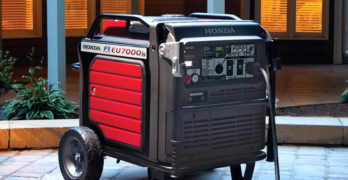 Whether the engine is 2 or 4-stroke, they will generally be in the region of 20-25cc. As with automobile engines, the actual design of the engine will have a big effect on how much power it delivers and its fuel consumption. So while you may think a 22cc engine may be less powerful than a 25cc from a different manufacturer, this won’t necessarily be the case. It really isn’t easy to determine what type of power you’re going to get without testing the machine. Even then, the differences may not be that noticeable. Fortunately, we’ve taken the guesswork out the equation for you by choosing three of the best commercial weed eaters that have been put through their paces. One of the models (Husqvarna 324L) has a 4-stroke engine and the other two (Tanaka TCG27EBSP and Hitachi CG23ECPSL) have 2-stroke engines. The cheaper Hitachi CG23ECPSL has a slightly smaller engine than the other two and is not quite as sophisticated. The two more expensive weed eaters are closely matched in terms of engine size and their power output is very similar. What they all have in common is that they all come highly recommended by both homeowners and landscapers alike. So you can be assured that the engines used in all of these weed eaters are up to the task of cutting through thick weeds and tall grass. While you can’t see inside the gearbox and probably have no idea of how it works, this is just as important as the engine itself. The gearbox delivers the power to the cutting head and needs to be tough and well-designed. When looking at the machine, we can get some clues as to how they’ve built the weed eater. A larger gearbox with a cast aluminum housing is an indication that the engineers have done their job properly. Again, we’ve ensured that you’re getting what you pay for and all three of the weed eaters in this review have gearboxes to match the power that the engine delivers. The shaft can be curved or straight. Machines with a straight shaft usually cost more and, while this doesn’t make the machine perform better, it does offer better reach. As a tall guy, I definitely prefer a straight shaft. A weed eater with a straight shaft is also safer because you are further away from the cutter and this means that you’re further from the flying debris. Weed eaters are known as string cutters because they use nylon string instead of a conventional steel blade. This is what makes them such versatile machines. A blade is easily damaged by stones and it’s impossible to cut up to a wall or any solid surface with a blade. The nylon string is flexible so it can handle most hard objects and if the string breaks, no big deal. It’s cheap and easy to replace. The problem with nylon string is that it wears down easily so you need to replace the string frequently. Traditionally, you would use a string that’s the exact width of the cutting path and this starts to wear down as soon as you start using it. So as you work, your cutting path is reduced by small amounts with every minute that passes. This reduced their efficiency. For this reason, the bump head was invented, which negated this problem. This means that you can roll several feet of nylon string around a spring-loaded barrel. By tapping down on the bump head, it will automatically release a few inches of string and a small blade inside the cutting guard cuts the string to the correct length. So you can work constantly with the full cutting capacity of the string. It’s an amazing invention which has drastically improved the efficiency with which these machines work. As great as the bump head is, I’ve been through a few with different brands of weed eaters. Cheap bump heads are more trouble than they’re worth. If it’s not made of quality materials and designed well, the mechanisms jam and basically don’t function like they should. So you end up spending more time opening the bump head assembly and fixing it than you do working. So as great as these mechanisms are, it’s really important to know that you’re getting decent quality. Making it really important to buy a weed eater from a trusted brand. Cheap bump head assemblies look exactly the same as decent ones. So it all comes down to the faith you have in the manufacturer. Like so many things, you get what you pay for. Commercial weed eaters will have a much wider cutting path than the smaller machines. This means a longer string, generally, about 17”. A thicker string is also going to last longer and be able to do more heavy-duty cutting without breaking the string. I prefer twisted string to the straight type as this is also stronger. Though your string type is not brand specific. As long as your weed eater can handle the correct width, you can use any type of nylon string. The best commercial weed eaters are designed to eliminate vibration as much as possible. Engines and gearboxes are designed to operate as smoothly as modern engineering will allow. Even with the best technology, weed eaters vibrate quite a lot. This causes strain on your arms and fatigue will reduce the amount of time that you’re able to spend doing what you intended – trimming the lawn and cutting back weeds. So the handle design is more critical than one might think. There are two types of handle designs. Bike handles have two separate grips, like the handlebars of a bike. A loop handle is a wide loop on the shaft offering a variety of gripping positions for the operator. I prefer loop handles but this is really a matter of preference. Many prefer bike handles. So, in the end, each one of us will choose the handle type based on personal preference. What’s really important is the amount of padding on the handles, this is what reduces the vibration that you feel. The position of your throttle trigger can also be important and not all of them are the best for left-handed operators. Bike handles are almost always designed for right-handed operation, whereas loop handles can be used with either hand. Having concluded what to look for in a commercial weed eater, let’s put this into practice by reviewing your best options. These machines meet the criteria I’ve mentioned above and can, therefore, all be considered as being among the best commercial weed eaters. They differ somewhat but are all great machines. Only one can hold the top position as the ultimate commercial weed eater. In my opinion, this would be the Tanaka TCG27EBSP. Usually, Husqvarna would be my first choice and I can see many preferring the Husqvarna 324L, based on their respect for the brand. In truth, both of these are exceptional weed eaters. So there isn’t an outright winner, it really is a matter of opinion. The Hitachi CG23ECPSL is the cheapest of the three and isn’t quite up there with the other two. It is, however, a heavy-duty, powerful weed eater and can certainly hold its own when compared to any of the best commercial weed eaters. To decide which of these machines is going to be the best for you, I’m going to give you a detailed review of each one. So you can be the judge, after all, the final decision is going to come down to what your requirements and budget are. Thoughtful design and smart engineering makes this one of the best commercial weed eaters for the money. Well-balanced. Well-priced. Well-made. Great Trimmer. 25cc, 4-stroke engine operates on pure gas. No need to mix oil and fuel. Engine and starter have been designed so the machine starts quickly with minimum effort. Resistance in the starter cord is reduced by up to 4. Equipped with a vibration damping system that is designed to reduce vibration and make operation easier. ✓ View or download the MANUAL and the PARTS LIST for the Husqvarna 324L commercial weed eater. Ordinarily, The Husqvarna 324L would be my first choice when buying a quality weed eater. This is because I’m a creature of habit and I know from years of experience that Husqvarna make some of the best garden tools. It’s only after reviewing the Tanaka TCG27EBSP that I placed the Husky in second place. That’s not to say that I’ wouldn’t hesitate to buy the Husqvarna – it’s a fantastic weed eater and has all the heavy-duty attributes to make it one of the best commercial weed eaters. that I’ve owned in the past have used 2-stroke engines and these have been incredibly reliable. I’m no engineer and I trust that the guys at Husqvarna know what they’re doing. I guess it might have something to do with environmental issues. In recent years, Husqvarna have made a big deal about producing the most eco-friendly engines and 4-stroke engines do have the best emission levels. So it goes without saying that this engine meets all the most stringent emission control standards, exceeding the minimum requirements for both EPA and CARB certification. In the end, it delivers the power that you want. The 25cc engine provides 1.07HP at 7000 RPM which is plenty and it revs all the way up to 12,000RPM – though it’s not recommended to go above 8330 RPM but, even this, is remarkable for a 4-stroke engine. All this means that it has a rev to power output ratio that just about matches any 2-stroke engine. It has the trusted Husqvarna air purge system and starts perfectly. This engine is connected to a flex drive straight shaft to an incredibly robust gearbox with a 30° angle. Power at the cutter is incredible and the Husqvarna can eat through heavy brush without feeling any strain. The bump head or, as they call it, the Tap ‘n Go quick line feed is as tough as they come – supplying a good length of twin line. The head will accept any size string so you can go as heavy-duty as you want. The soft-grip loop handle is perfectly comfortable and can be adjusted for any working height. It has an equally comfortable grip at the top of the tube with a very easy to use throttle trigger. Lightweight aluminum and very durable plastics mean that Husqvarna 324L is a breeze to use and incredibly rugged. It weighs only 11.24 LBS, so you can swing it around with ease and you know it can handle what you throw at it. They make a great harness for this weed eater that is adjustable and fit’s over both shoulders, this makes the Husqvarna really comfortable to use and you’ll work for hours without feeling it. Though this harness is sold as an optional extra, you’ll need to haul out some extra cash, but it will be money well-spent. 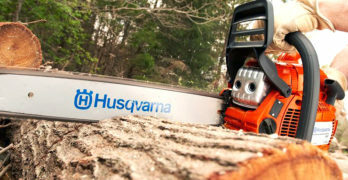 Commercial landscapers and homeowners alike have come to trust Husqvarna to deliver the goods. The Husqvarna 324L is a very dependable machine and is guaranteed to work hard year in, year out. You’re also assured of quality backup and service for life, along with a 1-year warranty. Best commercial weed eater for the money. Excellent value and power. Built to endure years of punishment. 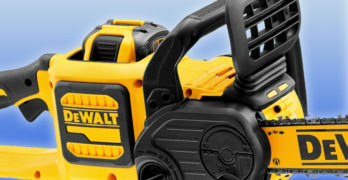 2-year commercial use warranty and a 7-year consumer use warranty. Robust aluminum fan case High durability and reduced vibration are achieved by using robust aluminum for the fan case. 2 piston rings : Compared to the conventional single piston ring. Improves combustion chamber sealing to secure gas pressure. Also enhances heat-transfer from the piston to the cylinder wall to extend lifetime of the sliding components. Low vibration : Sets a limit on rotation speed of engine in the high-speed range, reducing vibration and noise. Asymmetrical handle configured for ease of swinging the tool body, reducing fatigue. Provides operation in a stress-free posture. ✓ View or download the MANUAL for the Tanaka TCG27EBSP. The Tanaka brand is owned by Hitachi, which like so many Japanese companies, has risen to become one of the premier names with an outstanding reputation. The Tanaka TCG27EBSP is an incredibly tough machine. These guys have gone to extreme lengths to build one of the most durable commercial weed eaters that you’ll find. For example, the piston has two rings, making it more durable. The gearbox also has four bearings, instead of the usual three. Every component is made to the highest standard with plenty of heavy-duty cast aluminum. The Tanaka has a really powerful 26.9cc 2-stroke engine. With 1.2 HP, it’s quite a bit more powerful than its Husqvarna counterpart. Though, as is to be expected, it doesn’t reach the same high standard as far emissions go. The Tanaka meets EPA Tier 3 emission levels, it’s not CARB certified. It cannot, therefore, be sold in California. Power is transmitted via a straight, solid steel shaft to one of the best gearboxes. This ensures a really smooth power delivery from an incredibly durable system. The fiber-lined clutch is enclosed in a cast aluminum housing, which is yet another example of the heavy-duty engineering that’s gone into this machine. 4 ball bearings reducing axial run-out of drive shaft and gears. A cool advantage is the choice of handles. The Tanaka TCG27EBSP has a loop handle model (SL), or a bike handle (S). Whichever handle type you choose, you’re going to get plenty of soft padding to make it a very comfortable weed eater to use. The bike handle design is particularly impressive. It is not centered like most. Instead, a well-shaped aluminum tube extends to one side of the central tube, this makes it very easy to maneuver and you can use it with the left or right hand controlling the throttle. The bike handle also folds against the center tube for compact storage. Either of the two handle options are fully adjustable to get the perfect position, regardless of your height. The Tanaka weighs only 11.68 LBs and is very low in vibration. You get a harness with the machine. While this harness isn’t as good as the one you could get for the Husqvarna, you don’t have to pay extra for this. The Tanaka harness is definitely better than the single shoulder strap that you get with cheaper weed eaters. It fits around your neck with straps running down either side. This is an okay design, but it’s better to have the weight distributed over both shoulders, like the harness that’s sold for the Husqvarna. It has an excellent bump head – probably one of the best designs I’ve seen. It’s incredibly tough with some cool user-friendly features. It has a tool-free spindle lock and push to release clips for opening the bump assembly housing. There are so many small details that indicate that the engineers have gone the extra mile to develop one of the most durable commercial weed eaters ever made. The steel plate below the fuel tank is a perfect example of this attention to detail. You’ll find this type commitment to excellence throughout the Tanaka. It’s a remarkable work engineering brilliance. As much as I’m loyal to the Husqvarna brand, I have to say that the Tanaka TCG27EBSP is the superior machine and takes first prize for the best commercial weed eater. They cost about the same and both are extremely durable machines. But the Tanaka is a fair deal more powerful without adding any extra weight. There are a few small details in the design and construction of Tanaka that indicate a more robust approach to the engineering behind it. This is certainly evident in the incredible warranty that they offer – 7-years for residential use and 2-years for commercial use. Best commercial string trimmer in terms of overall value. 69.6″ overall length to lessen fatigue from bending over while working. The Hitachi CG23ECPSL is by far the cheapest in this review of the best commercial weed eaters. It is by no means a bargain basement special of a low-quality standard. Quite the opposite in fact. This is a Hitachi machine and is extremely well-made. When I compare the price difference between this weed eater and the other two, it’s not easy to justify why one should pay so much more for either of the others. The Hitachi CG23ECPSL is a bit less powerful and doesn’t display all of the super heavy-duty traits of the Tanaka or the Husqvarna, but comes quite close. The 22.5cc engine is the smallest of the three. I don’t have HP or KW specs for this weed eater, but you can be sure it won’t quite match either of the more expensive machines. Though it can’t be far behind, I’d guess around 1HP or slightly less. For most purposes, you wouldn’t really notice the power difference. This comes with a slightly smaller gearbox which is probably less heavy-duty than the other two. Even though this weed eater is not altogether as tough as the others, it’s a very robust machine. So when cutting tough weeds, with a stem that’s over an inch in diameter, the smaller Hitachi won’t be quite as good. This is a small sacrifice when you look at the price. The big advantage with the smaller machine is a noticeable weight reduction. This weed eater weighs only 10.3 LBS. It has low vibration levels with soft-grip handles, a loop handle at the front and a grip on the tube. Again, the padding is not quite as generous as the more expensive models, but this is still a very comfortable machine to use. The lower weight does a lot to compensate for this. The loop handle is adjustable and enough range for any working height. The bump head is great and very durable. It fits onto a cast aluminum housing which is also a very durable item. The 69.6” straight shaft gives you really good working length, so this weed eater doesn’t fall short of the bigger machines. At a really fantastic price for a tough commercial weed eater, the Hitachi CG23ECPSL is an incredible deal. If you don’t need the most powerful weed eater, it makes a lot of sense to buy this machine. You’ll be saving quite a bit and it’s going to work hard for years. Coming from the Hitachi stable means that it’s up there with the best of them with a warranty to match. Like the Tanaka, which comes from the same company, you’re getting a 7-year residential warranty and a 2-year commercial warranty. Fuel Tank Capacity : 16.2 fl. oz. Correct usage and maintenance of your weed eater is going to mean that it will last as it should, work properly, and ensure that you’re safe. I’m going to share some of my experience in this regard. Even the best commercial weed eaters need to be cared for correctly, so there’s some important stuff in this section of the article. Because bump heads are an important, and very handy feature of modern weed eaters, I want to take the time to explain these mechanisms properly. I’ve tried a few over the years and, being the technical go-to guy for most of my friends and family, I’ve had the opportunity to see a lot of different types. Some of the cheap machines have a very nasty way of doing things. Though if you choose correctly, and buy one of the best commercial weed eaters (like the three in this review), you’ll get excellent use from your bump head. There are few things to know about these components though. One thing I’ve seen with all bump heads is that they will become damaged by the heat that results from friction on the shaft and gearbox. The best way to eliminate this is by using a flange disc. There are cheaper, low tech ways of doing this, but a flange disc is the best way of doing this. The three weed eaters that were reviewed here all use this method, so I’ll explain the details. The flange disc is situated between the bump head and the gearbox housing. While this may look like an insignificant part of the machine, it’s crucial to ensure that the bump head lasts like it should. For this reason, you should inspect this disc regularly, I do this every time I install new string into the bump head. Over time, the flange disc will wear down. As they get older they can even crack. Fortunately, these parts are inexpensive and easy to change. If you notice excessive wear, replace the flange disc immediately. A cracked or worn disc will result in irreparable damage to the bump head. When replacing the string inside the bump head, make sure you do this properly. Most bump heads use two strings. Inside the bump head is a barrel onto which you wind two separate pieces of nylon string. The spool is separated by a plastic disc – on piece winds onto the lower half and the other onto the top half. Each piece passes through a hole in either side of the bump head assembly. The string is usually secured into a small hole in the center of the barrel. You need to make sure that you push the tip of the string firmly into this hole. I’ve found that a pair of longnose pliers makes this much easier. It’s important to wind the string evenly over the barrel. This means starting at the bottom and winding it with each consecutive winding being directly next to the previous one. When you reach the top of the barrel, place the next winding directly on top of the preceding one. You’ll then work your way toward the bottom, repeating the procedure with each layer. If the string crosses over itself, it won’t unwind properly as you press down on the bump head to release it. There’s a limit to how much string you can wind onto the barrel. The plastic disc at the center of the barrel indicates the limit as to how much string you can use. Never wind past this disc. Trying to use too much string will cause the spool of string to rub against the side of the bump head housing. This might cause it to jam and will certainly generate extra heat from the friction. If you’re using thicker string, you won’t be able to wind as much onto the barrel, but the thick string will last longer – particularly if cutting weeds with thick woody stems. You should always wear long trouser when operating a weed eater, debris being flung up as you work will, otherwise, result in injury. It’s also recommended that you wear eye and ear protection. Gas engines are loud and ear protection not only makes things more comfortable, they also protect your ears from damage. After installing new string, hold the weed eater in the air before engaging the throttle. Make sure that the cutting head is as far away from you as possible. This is because a blade inside the cutting guard will cut off the excess string and this flies off at high speed. If you’re cutting long grass or weeds, start near the top. You should never cut more about 5” at a time. If you start at the ground when the grass or weeds are more than 5” tall, you’ll place excessive strain on the engine and gearbox. This will end up damaging the weed eater. Long grass and weeds can also wrap around the shaft as it rotates, this also ends up harming your weed eater. Work your way down until the base of your weed eater is just above the ground. You don’t want to press the base of the weed eater into the ground. The only time you’ll do this is to release more string from the bump head. Though when you do this, it should only be a quick tap against the ground. Don’t do this too often, you’ll just end up wasting string by releasing too much of it. I usually lift the head up every few minutes to see how much string has been used and bump down lightly once or twice and then check again. You’ll soon get an idea of how much string you’re wearing through. If you’re cutting through weeds with hard thick stems, the string will wear down faster than it would if you were cutting regular grass. When the string comes into contact with walls, fences, and other solid surfaces, it will wear down very quickly and will easily break. To avoid this from happening, use the blade guard as a guide. Run the weed eater along the wall with blade guard pressing against the wall (or other solid objects). This prevents the string from making direct contact with the hard surface. As with all gas engines, you need to do some routine maintenance. Your instruction manual will give you all the particulars, though there are few basic things that you should do every time you use the weed eater. Before starting the engine, remove the air filter and blow it clean. If you’re using a 4-stroke machine, check the engine oil level and top it up if required. It’s really important to do this every time you use it. While you’re working, occasionally check that nothing has wound around the shaft. Sometimes there can be rope, string, or wire that you’re unaware of and this can work its way around the shaft, impairing the weed eater’s performance. This is likely to damage the machine in the long run. Clean the buildup of grass clippings from the machine regularly. This should be done every time after you’re done working, more frequently is even better.